Some recent research apparently shows that the first brand of some particular good to hit the shelves in some particular area (Miller beer in Chicago, Heinz ketchup in Pittsburgh, etc.) manages to retain outsize market share for a very long time. You see some of the stereotype “latte liberal” stuff going on here, but it’s also clear that pure proximity to Seattle or to Bentonville is a big factor. And in the CPG market, these kind of impacts seem to last a long time. And somehow Tim Horton’s can be very popular in Canada but not make it big in the states. Why doesn’t In-and-Out Burger spread to the east coast? 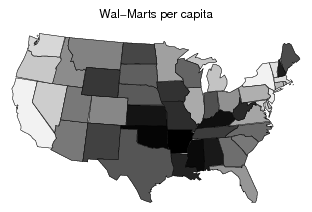 I don’t know about Starbucks, but a big part of the reason the Walmart map looks this way is simply that Walmart management chose to expand first and most densely close to its home territory. In the case of In-N-Out, my understanding is that the family that owns them has declined to sell franchises, which limits their geographical reach based on how fast they can finance growth through internal cash flow. So there’s more going on than just first mover advantage. Though there’s certainly plenty of that too, especially for food items, I think, where people get accustomed to a particular taste and stick with it for a long time. Taste in candy, for example, is famously set in childhood, which is why Americans scarf down megatons of Hershey’s chocolate every year, while the rest of the world considers it barely fit for pig swill. Lots of interesting stuff going on here.